May makes a great time to visit Dallas-Fort Worth when the sun is shining and the flowers are in full bloom. Visiting snow-dwellers can trade in their boots for flip-flops and enjoy the metro region's lovely spring temperatures. Local Texans come out of the woodwork, too, as this is the month when the area blooms with art and music festivals, fireworks shows, and even a Mother's Day home tour. (You'll drool over the architecture!) Get outside and take advantage of the offerings. Just make sure to pack a raincoat in case of a passing shower. Also known as the Scarborough Fair, this a Renaissance-themed event brings you back to 1533, during the reign of England’s King Henry VIII. The festival—which began in 1981—runs for eight consecutive weekends, including Memorial Day weekend. 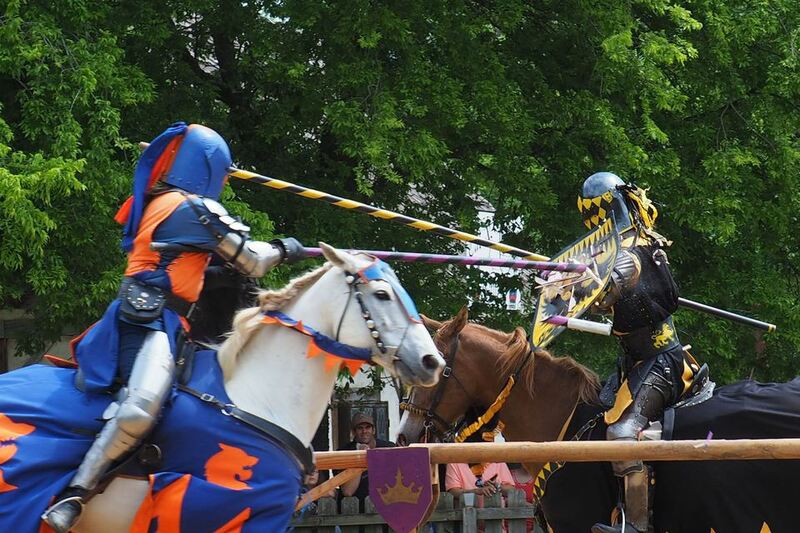 Entertainment consists of approximately 200 performances on 21 stages and three jousting tournaments daily. The food is a spectacle, as well, with vendors serving up enormous turkey legs and delicacies on a stick, while on-site pubs and taverns serve adult beverages. Reserve tickets for the family and bring kids under four-years-old for free. The Cottonwood Art Festival—a juried art show that takes place the first weekend in May in neighboring Richardson, Texas—features the works of national artist alongside food, music, beverages, and art workshops for kids. Catch performances from local rock, country, jazz, blues, swing, and folk bands while attending one of the premier fine arts events in the country. Fort Worth's favorite family festival comes complete with carnival rides and games, a children's workshop area, interactive gardening demonstrations, live music, and food. Each of Mayfest's "zones" along the banks of the Trinity River offers a different experience for festival goers. Head to The Midway for bull rides and carnival fun, The Zone serves up pony rides, complete with a petting zoo. Take a paddleboat out on the river, and then retreat to The Oasis for some good Texas grub. Every Mother's Day, the Swiss Avenue Historic District in Dallas hosts a home tour of one of the finest twentieth-century neighborhoods in the Southwest. The tour includes approximately 200 carefully preserved and restored homes (listed in the National Register of Historic Places) that represent several architectural styles including Spanish Revival and Prairie Foursquare. Guests travel between stops on air-conditioned mini coaches and prepared food and beverages are served throughout the weekend at Savage Park. Considered one of the most exciting events in North Texas, the town of Grapevine delivers Main Street Fest. This event coincides with American Craft Brew Week and features 75 craft brews from over 35 breweries across 15 states. Dance to non-stop entertainment, seek out your favorite festival ​food, and shop the day away. As an added bonus, free shuttles take you from historic downtown Grapevine to the area's wineries and tasting rooms (no designated driver needed). More than 1,000 butterflies come to Plano, Texas each year to vacation in an 800-foot mesh tent filled with green foliage, water fountains, and feeders. Walk through the conservatory and marvel at the flowers while interacting with the butterflies—letting them land on your hand or on your clothes. Tickets are available for purchase at the display and proceeds benefit the Greater Plano Kiwanis Club. This multi-day eclectic arts and music festival in Richardson, Texas provides an opportunity for family fun. Listen to local and national acts perform on three outdoor stages. Shop for unique art, home decor, and specialty clothing at Wild! Marketplace. Wildflower! Eats & Drinks offers local Texas fare. And Wildflower! Kids provides an interactive place for kids to enjoy art, games, informative activities, and kid-friendly tunes. The largest gathering of Asian Americans in the Dallas area is back and bigger than ever. This free family event features authentic Asian cuisine, cultural performances, and unique products and artwork at the festival's own Asian World Market. Eat authentic Asian-inspired food while your kids engage in children’s activities and games. Tickets aren't needed for this event, but come hungry. Ennis, Texas celebrates Memorial Day weekend with their National Polka Festival. Czech heritage festivities include performances by polka music bands, a king and queen dance contest, and a parade, complete with floats, bands, and costumes. For athletes, there's even a Polka Fest Run on Saturday, which includes a 10K, a 5K, and ​a one-mile fun run. Dragon Boating, a traditional Chinese pastime, is one of the fastest growing water sports in the world. That said, most teams who participate in Irving, Texas' Dragon Boat Festival enter the novice category. The annual festival features exciting dragon boat races, colorful kite flying, cultural performances, a lantern festival, and Asian food, arts, and crafts. It's free to the public and proceeds help fund the Marco Polo World Foundation. On the last weekend in May, this foodie festival graces the street of Addison, Texas. Enjoy fine regional food and craft libations from local restaurants and food purveyors. This celebration includes live concerts, face painting and a balloon artist for the kids, as well as 50 artisan booths selling art, novelty items, and clothing. After you've had your fill of food, head to the festival's carnival where you'll find traditional carnival rides, midway games, and carnival food. Fried dough, anyone? The Texas Scottish Festival and Highland games—held mid-May in Decatur, Texas—features all things Scottish. Known for its outstanding entertainment, this celebration showcases Scottish musicians, professional athletes, and champion highland dancers. An exciting array of food, merchandise, souvenirs, and beverages from Scotland and Great Britain are available for purchase. Get your early bird discounted tickets before May 1 and reserve primitive camping through the event's online reservations system. Good Luck and Happy New Year Y'all!